Can ATC handle a flight as emergency although the pilots have not declared an emergency? The preliminary report for the LNI610 crash shows how much distractive conversation there was between ATC and LIN610 at a time when the pilots clearly didn't have the aircraft under control – as evidenced by the FDR data – and should have talked to each other to diagnose the problem, rather than to ATC. This violates the principle "aviate - navigate - communicate". At 23:21:53 UTC, the LNI610 SIC requested approval to the TE controller “to some holding point”. The TE controller asked the LNI610 the problem of the aircraft and the pilot responded “flight control problem”. 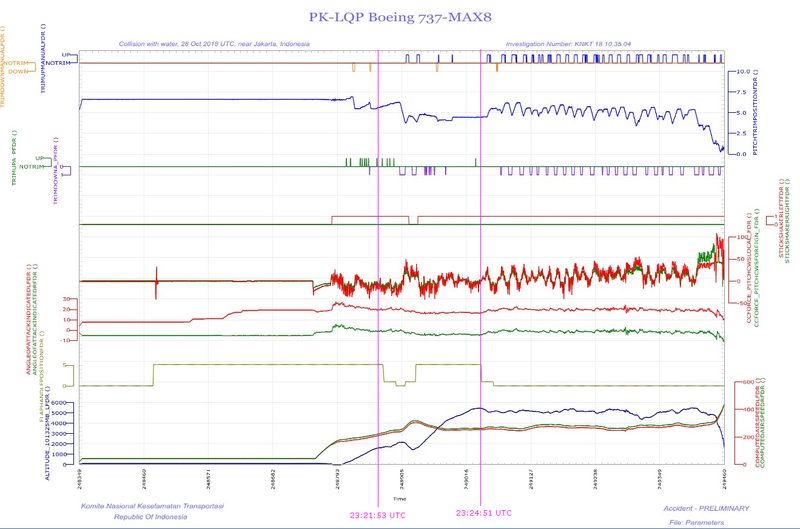 At 23:24:51 UTC, the TE controller added “FLIGHT CONT TROB” text for LNI610 target label on the controller radar system as reminder that the flight was experiencing flight control problem. The preliminary report reveals how much dispensable talk there was between ATC and LNI610 in this crucial moments even after the flight was marked as experiencing flight control problems. Seeing that the flight was marked by ATC as "FLIGHT CONT TROB", could ATC have handled the situation differently, e.g. bothering them less or even handling the situation outright as PAN PAN (don't restrict navigation, reroute other traffic, avoid communication as much as possible) even though it was not declared as such by the crew ? Or did they essentially have their hands tied, obliged to treat the flight as any other as long as no emergency is officially declared via either MAYDAY or PAN PAN ? I very much welcome any answers, including from pilots or ATC controllers who are unfamiliar with this particular accident, but can share their work experience (how this is handled in practice) AND/OR point to specific rules (how this should be handled in theory). In the US, a controller has the authority to treat any situation as an emergency, and they do. I have had controllers "declare" an emergency multiple times, even when I thought I did not have an emergency. There are some advantages to the controller. His work gets shed to others, and his supervisor is at his side to assist. At one point, after ice, delays and trying to get into a DC airport close to the Christmas holiday, I declared "minimum fuel" which I didn't consider an emergency. I just wanted to let the controller know that if they vectored me towards West Virginia again, I would be landing close to or at reserves. The weather at the destination was far better than the ice I have been flying through at 13,000, but I wanted to avoid plunking down at Martinsburg, away from my destination to buy another load of fuel. Immediately I got handed off to a Dulles controller, whose radar had better coverage than Baltimore Approach who handled approaches normally for my destination. I got kid glove treatment, and did not get further delays, and landed at my destination without any incident. After the paperwork, I dipped the tanks, and figured I still had about 27 minutes more fuel than my minimums for IFR night flight with a diversion to better weather. Similarly, having gear problems almost always gets an "emergency" status. I will say one thing, dealing with a cockpit fire, while the controller keeps asking again and again the same questions can get tiring, but they are trying to get their job done the best as they can, just as the pilot is. So in application to the LIN610 and other situations, it makes sense that the pilots exercise their ability to tell a controller to "standby." It works some of the time. I am not as familiar with the US Controllers Handbook as I have been in the past, but I am confident that the controllers have authority to declare an emergency. But keep in mind that they are products of their environment, just as pilots are, and they have training, objectives, experiences and organizational expectations which change and vary. If the words “Mayday” or “Pan-Pan” are not used and you are in doubt that a situation constitutes an emergency or potential emergency, handle it as though it were an emergency. Because of the infinite variety of possible emergency situations, specific procedures cannot be prescribed. However, when you believe an emergency exists or is imminent, select and pursue a course of action which appears to be most appropriate under the circumstances and which most nearly conforms to the instructions in this manual. In other words, if you think there could be an emergency or potential emergency, use your judgement to handle it appropriately, regardless of which words are used. The controller's hands are not tied by the failure to use the magic words "PAN PAN" and or "MAYDAY." Controllers aren't mind readers though, and don't inherently know what an aircraft in distress needs unless that's communicated. "Flight control problem" encompasses a pretty wide range of conditions, and since the crew asked to proceed to "some holding point," it could be reasonable for the controller to conclude that the situation was stable until the crew stated their intentions. Whether the controller's communications interfered with the crew's ability to address the problem is something that could be addressed in the investigation's final report, along with recommendations to improve ATC procedures in the future. The job of ATC is to help the pilots get where they need to go safely and efficiently. In order to do that, they have to ask questions, to know what emergency services need to be alerted or where the airplane might be able to land if needed. The mantra of pilots is aviate, navigate, communicate. Communication comes last. If they are saturated with the most important items (flying and navigating), they are trained to worry less about communicating. Unless ATC has something more important to add, they can wait. The systems is already designed to handle communication failures, even if inadvertent. ATC can always clear other aircraft out of the way if they have to. If an airplane says they have flight control issues, and begins flying erratically, you can be sure that's their first priority. ATC does not have to have a formal declaration of emergency to change the way they are handling traffic. Sometimes they can tell something is wrong and they do all they can to help. But they can't know everything. If a plane is having issues, it's the pilot's job to deal with that and let ATC know what they need. The flight controller typically has full authority to conduct traffic in a safe manner. If they felt they had to redirect traffic, allow the aircraft to travel unrestricted, or reduce the amount of communication, it's within their power to do that - of course, they may be questioned after the fact whether it was necessary, but they certainly have the right to make those decisions. However, a controller cannot officially declare an emergency for the aircraft, as that decision can only be made by the flight crew (more specifically, the captain would be the authority on whether it is an emergency. In the case of Lion Air 610, the pilots did indeed say they were having trouble with their flight controls, however the information they transmitted to the controllers would not constitute an emergency alone. Non-critical issues with flight controls are somewhat common, and typically they would return to land under normal procedure to be checked out by mechanics. 610's total loss of control happened fairly suddenly, though there was partial/temporary loss leading up to it. Not the answer you're looking for? Browse other questions tagged air-traffic-control commercial-aviation accidents regulations airline-pilot or ask your own question. How would an airplane land if the on-board radio breaks down? I accidentally deviated from an ATC instruction as a student pilot. How bad was it? How could MH370 fly west to Straits of Malacca within time frame without being seen on Radar? How much responsibility does ATC have to alert a flight about being in a dangerous situation? How does ATC control / separate Airbus Industrie test flights? Should I mention an altitude restriction from the previous controller during an ATC handoff? Why is it the ATC recording of Ethiopian Airlines Flight 302 is not yet available online?